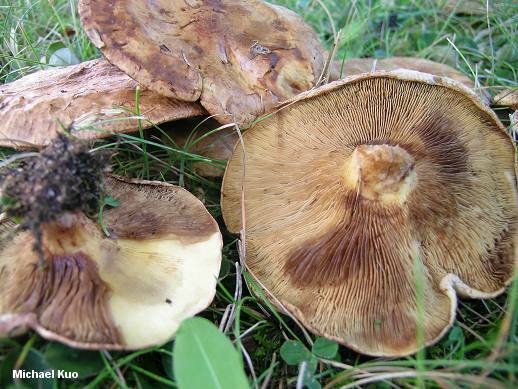 Paxillus involutus is a widely distributed, variable species found under a variety of trees. 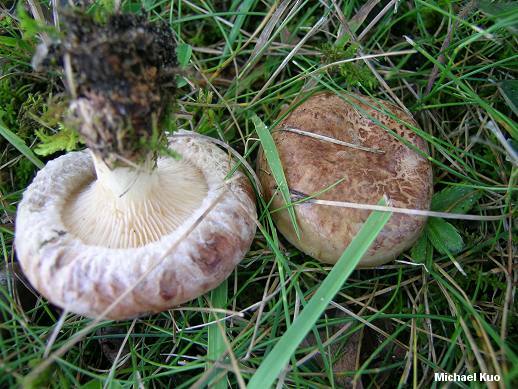 Its gills are its most distinctive feature: they stain brown when damaged, and they are separable as a layer (push with a fingertip just above the apex of the stem). 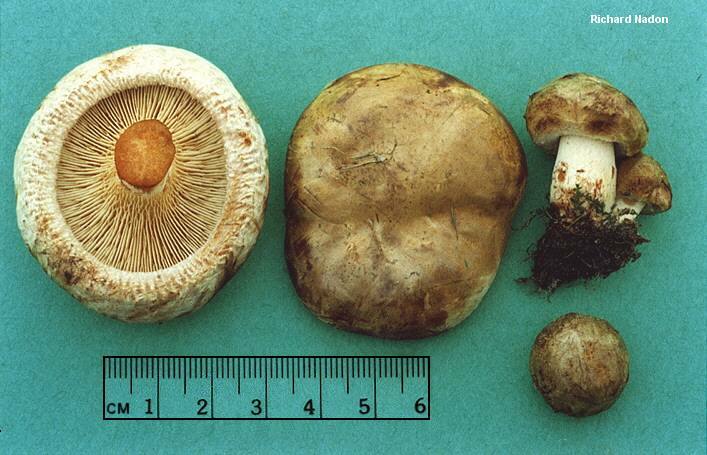 In northern and montane areas of North America, Paxillus involutus should be compared with Paxillus vernalis, which is nearly identical but features a somewhat wider stem (2-4 cm) and grows under quaking aspen and paper birch. The Paxillus involutus group has been subjected to both mating studies (Fries, 1985) and DNA analysis (Jarosch & Bresinski, 1999), along with traditional morphological analyses--and results have upheld the idea that Paxillus involutus and Paxillus vernalis are biologically and phylogenetically distinct, though they are difficult to separate on the basis of physical features. Thanks to Linda Sears for collecting, documenting, and preserving Paxillus involutus for study; her collection is deposited in The Herbarium of Michael Kuo. Ecology: Mycorrhizal with a wide variety of hardwoods and conifers; apparently also capable of existing as a saprobe on wood; found in woods and in urban settings; growing alone, scattered, or gregariously; summer and fall; widely distributed in North America. Cap: 4-15 cm; convex to broadly convex with a strongly inrolled, cottony margin; becoming planoconvex or centrally depressed; sticky or dry; smooth or finely hairy; brown to yellow-brown, olive brown, or grayish brown. Gills: Separable as a layer; running down the stem; close or crowded; often becoming convoluted or pore-like near the stem; yellowish to pale cinnamon or pale olive; bruising brown to reddish brown. Stem: 2-8 cm long; up to 2 cm thick; often tapered to base; dry; smooth or finely hairy; colored like the cap or paler; bruising brownish to reddish brown. Flesh: Thick and firm; yellowish; discoloring brown when exposed. Odor and Taste: Taste acidic or not distinctive; odor not distinctive or somewhat fragrant. Chemical Reactions: KOH on cap surface gray. Spore Print: Purplish brown to yellow-brown. 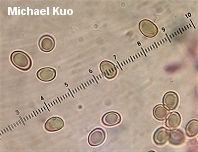 Microscopic Features: Spores 6.5-10 x 5-7 µ; smooth; elliptical. Pleuro- and cheilocystidia more or less fusoid; 40-90 µ long; with brown contents. Pileipellis a cutis of elements 3-6 µ wide, with brownish contents. Clamp connections present. REFERENCES: (Batsch, 1786) Fries, 1838. (Fries, 1821; Saccardo, 1887; Kauffman, 1918; Smith, Smith & Weber, 1979; Fries, 1985; Thiers, 1985; Arora, 1986; Breitenbach & Kränzlin, 1991; Phillips, 1991/2005; Lincoff, 1992; Barron, 1999; Jarosch & Bresinski, 1999; Roody, 2003; McNeil, 2006; Miller & Miller, 2006.) Herb. Kuo 09120701, 09130703, 10031202.